Honda Civic proudly presents world famous Blink 182 and My Chemical Romance in one jaw dropping tour! 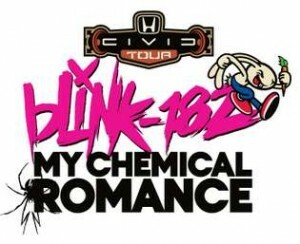 This Honda Civic Tour 2011 tour is the 10th anniversary of the Honda Civic Tour with blink 182 being one of the founding bands. It’s had such success and outstanding reviews over the years it keeps coming back year after year! If you’re planning on dancing the night away or starting your own mosh pit we suggest you hurry and reserve yourself a PIT ticket.